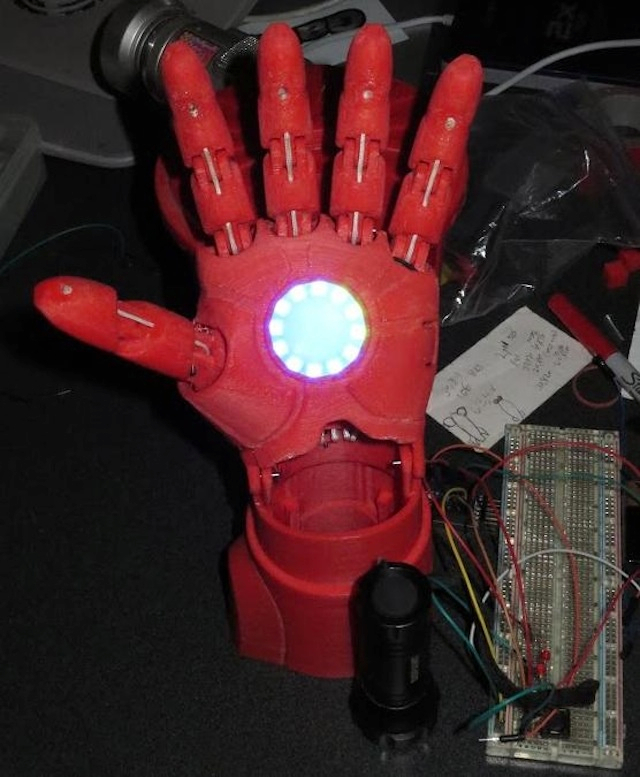 IRON MAN 3D Printed Child’s Hand #maketheworld #3DThursday #3DPrinting « Adafruit Industries – Makers, hackers, artists, designers and engineers! How can we help a child that faces everyday challenges with a disability? 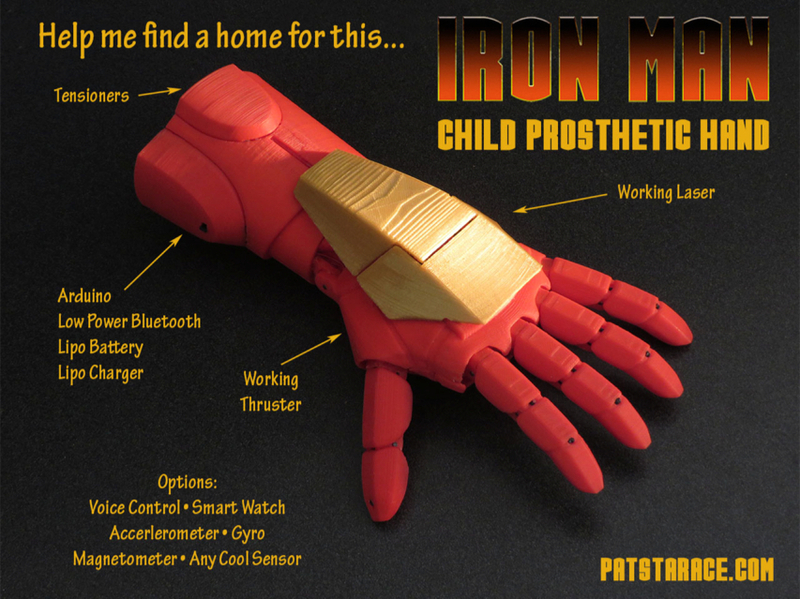 My answer is to give them the most awesome prosthetic hand, and raise their self esteem to Super Hero Levels. 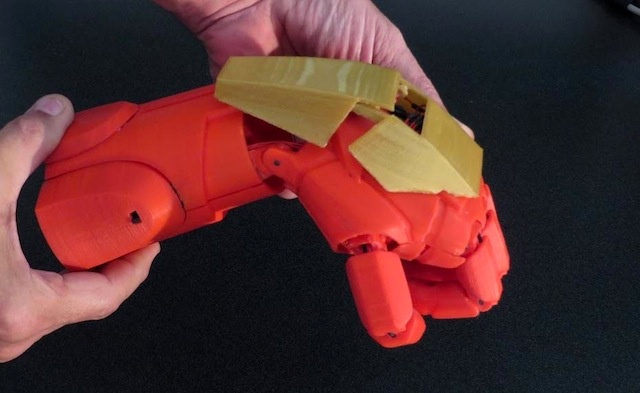 The vision was to create a hand, so that a child can have something that solves a mechanical challenge, is affordable, and mostly Looks Awesome! Hide all the strings, so nothing distracts from the magic. Pat Starace has the ability to take ideas to a very high level while keeping the ultimate design and engineering as efficient and elegant as possible. His background in animation mixed with all sorts of fabrication and embedded systems experience makes his work really unique. I loved the look and felt positive emotions as soon as I saw the first few seconds of the video, and I also got an extra boost when I saw the Adafruit NeoPixel ring (cool, I use those!). There is something great about getting that feeling of accomplishment vicariously through another maker’s project. It goes beyond the “I wish I had made that” to “I’m so glad that Pat made that,” because it is something that will make the world just that much better. Thanks to Pat and thanks to all the contributors who made the concepts and components that brought this and all other open projects to fruition.